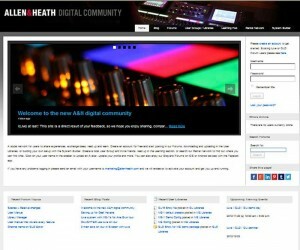 Allen & Heath has launched a new community website, a social network dedicated to users of digital audio mixing systems. The new website consolidates the company’s existing iLive and GLD Blog and Forums, and includes additional resources such as a Rental Network database, system configuration tools, and user libraries. 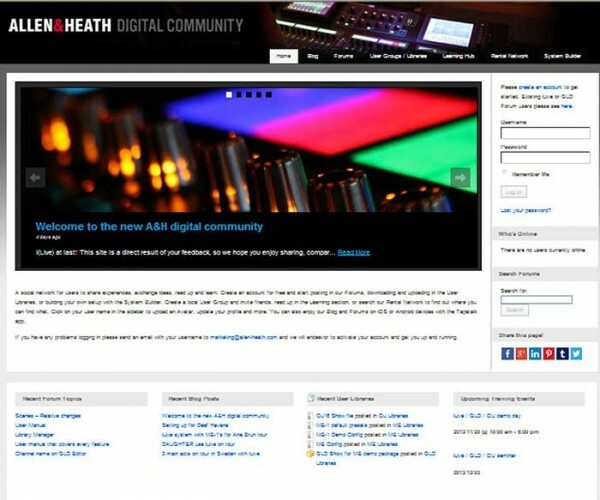 "The aim of the site is to enable users to share experiences, exchange ideas, and learn about all things digital at Allen & Heath. It's all about being connected. We wanted something that was easily accessible and similar in approach to wide-spread social networks," says Nicola Beretta, product manager at Allen & Heath. "Users can create a local group, invite friends, send private messages, update their status, comment, and share files, just as you would expect from other popular networking services." MD, Glenn Rogers, adds: "Coupled with the continuing popularity of social media platforms, our pioneering iLive Forum highlighted the value of interaction with, and also amongst, our customers. We are pleased to be the first company in the pro audio industry to offer such an integrated one-stop shop for users of our digital products." In picture: a screen grab of the community website homepage.